Thanks to GameInformer Magazine, the sequel to Transformers: War for Cybertron has officially been revealed. Called Transformers: Fall of Cybertron, the story continues to follow the Cybertronian civil war between the Autobots and Decepticons moving along later in the time line to events that lead to the trek that eventually brings the battle to Earth. The website has currently only offered teaser images of the two covers of the issue that is hitting newsstands on October 14th, 2011. The game is currently penciled in for a Fall 2012 release but that is subject to change. 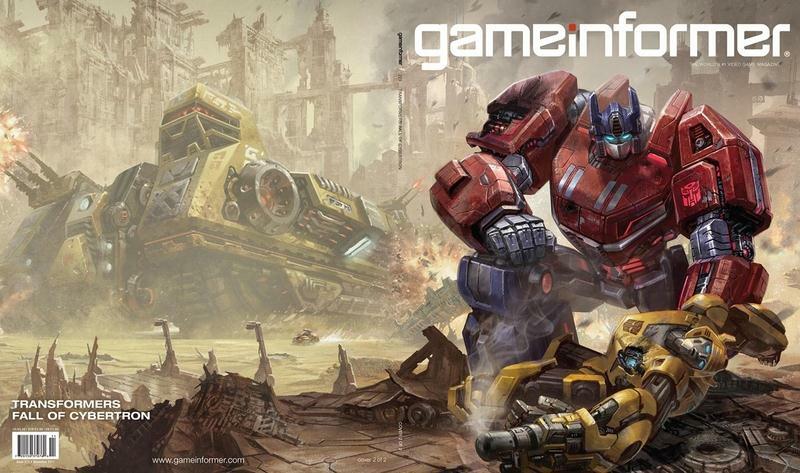 GameInformer has a Fall for Cybertron page to reveal information over the next month here. Santa Monica, CA - October 6, 2011 - Gamers will finally experience the epic battles that shaped the history of the AUTOBOTS and DECEPTICONS with the fall 2012 release of Activision Publishing, Inc.'s (Nasdaq: ATVI) TRANSFORMERS: FALL OF CYBERTRON for the Xbox 360® and PlayStation®3 computer entertainment system. 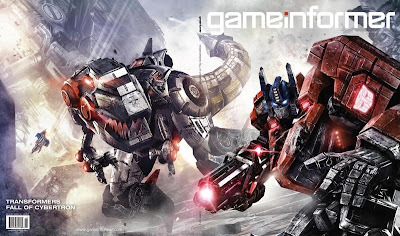 Currently in development by the acclaimed team at High Moon Studios, TRANSFORMERS: FALL OF CYBERTRON takes fans through the final, darkest hours of the civil war between the AUTOBOTS and DECEPTICONS as they fight for control of their dying planet, ultimately leading to their storied exodus from home. "High Moon Studios is an extremely talented development team having raised the bar of gameplay and TRANSFORMERS authenticity in their games," said David Oxford, Executive Vice President at Activision Publishing. "TRANSFORMERS: FALL OF CYBERTRON is an extraordinary project both for the studio and the TRANSFORMERS gaming legacy - the stakes are higher and the scale much larger than ever before, and we absolutely cannot wait for fans to see all the new characters and epic action that awaits them." For more information and exclusive updates, fans can visit www.facebook.com/transformersgame and follow the team via Twitter @HighMoonStudios. Finally, the sequel has been announced. I really love the first game, War for Cybertron. I loved the first game as well, by far the best Transformers game out there. I am curious though as to how they will explain robot dinosaurs on Cybertron. Would seem more rational that after the Ark arrives to earth in the 3rd game that they find an older Autobot ship/base with the Dinobots inside. Guess we'll wait and see. Or maybe Wheeljack just builds them with simple brains like he did in 1984. If you watch the High Moon Studios tour you will see the concept art for Wheeljack on the wall.